Take the NFPA 3000™ (PS): Respond to an Active Shooter/Hostile Event Online Training to understand the critical importance of a unified command. During active shooter and/or hostile events, a unified command and a high-functioning communication center are key elements in ending the incident as quickly as possible, with minimal loss of life. Learn about the best practices for a unified command, the role of the communication center, and how targeted public information and training programs can prepare your community to assist with response efforts. 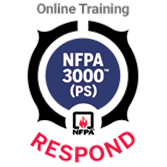 Take the NFPA 3000™ (PS): Respond to an Active Shooter/Hostile Event Online Training. Progress at your own pace to gain new knowledge and tools. Along the way, earn the NFPA 3000™ (PS) Respond Badge. This is the second of three courses in the NFPA 3000 (PS): Active Shooter/Hostile Event Response; Plan, Respond, Recover Program Specialist Online Training. Through this two-hour online training, you'll improve your understanding of how to respond to an active shooter/hostile event with a unified command. Complete this two-hour course and qualify for 0.2 CEUs. Upon successful completion of a course, participants will be prompted to download the CEU certificate and NFPA 3000™ (PS) “Respond" badge directly from the course site.